Lt-Commander Edward Smyth-Osbourne of the Royal Navy, HMS Invincible. 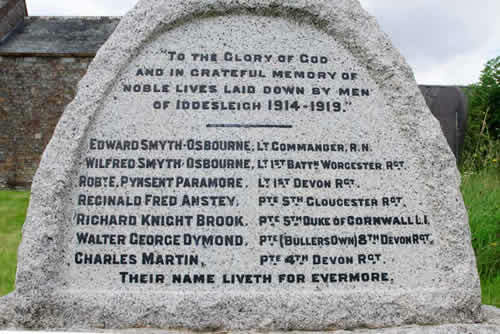 Son of John and Eliza Smyth-Osbourne of Ash House, Iddesleigh; brother of Wilfred (see below). Born in Iddesleigh 9 June 1884. Died 31 May 1916 aged 32 at the Battle of Jutland. Lt. Wilfred Smyth-Osbourne of the 1st Battalion, the Worcestershire Regiment. Son of John and Eliza Smyth-Osbourne; brother of Edward (see above). Born in Iddesleigh in 1894. Died 29 August 1915 aged 21. Lieutenant Robert Edward Pynsent Paramore of the 1st Battalion, the Devonshire Regiment. Son of the Rev. Joseph Rawle Paramore of Iddesleigh Rectory and his wife Charlotte Jessie P. Paramore (née Mathew). Born in Iddesleigh in the June Quarter of 1896. Educated at Sandhurst. Killed in Action 23 July 1916 aged 19. 40165 Private Reginald Fred Anstey of the 5th Battalion, the Gloucestershire Regiment; formerly of the Ox and Bucks Light Infantry. Son of John and Sarah Ann Anstey of Smytham Farm Iddesleigh. Born in Iddesleigh in 1898. Died 1 December 1918 aged 21. Buried in Iddesleigh Churchyard. 29045 Private Richard Knight Brook of the 1st/5th Battalion, the Duke of Cornwall's Light Infantry; formerly served as 2376 of the Royal North Devon Hussars. Son of Edward and Hannah Brook of Pixton Cottage, Iddesleigh. Born in Winkleigh in 1889. Died 18 August 1917. aged 28. 15015 Private (Walter) George Dymond of Buller's Own (the 8th Battalion), the Devonshire Rergiment. Transferred to the 2nd/6th Battalion then as 396107 to the 408th Agricultural Coy, the Labour Corps. Son of Giles and Bessie Dymond. Born in Iddesleigh in the March Quarter of 1897. Died 4 September 1916 aged 19. Buried in Iddesleigh Churchyard. 11419 Private Charles Martin of the Devonshire Regiment. Son of Edward and Eliza Martin. Born in Torquay in 1895. Died 14 November 1917 aged 20.